A new app is hitting the App Store next week that promises to change the way we deal with emails on Apple Watch. While there are already a few decent email apps for the wrist, like TL;DR or Outlook, there hasn't been a lot invested into creating unique and useful versions for Apple Watch. Jumpin Labs, which includes ex-Google, Apple and Path devs, has been working on a new way of emailing for the past two years and has finally completed Geronimo, which the company claims is a radically new email experience. The coolest new feature on it is the human-only filter, which let's you set the app to only send notifications to your wrist from real people, though the secret of how the app determines humans versus promotional emails hasn't been shared. The app works with Gmail to start with and other email services will be added. With Geronimo, users will also be able to search for emails from their wrist. Currently, Apple's native Mail app does not offer a search function so this feature could prove to be very useful on Apple Watch. Another feature that the native Mail app doesn't offer but Geronimo does is the ability to compose an email from your wrist. It won't be for everyone but the option is there to start an email with a new contact, not just reply to one. From the images provided, it also appears that Geronimo will have an interesting aesthetic. Images and attachments work well and whereas most Apple Watch mail apps have a darker theme, this design takes the opposite approach with a white theme. Geronimo actually looks like it will be really cool on the iPhone too. It uses gesture-based actions, like "tossing" emails into the trash, archive, or other action. You can also tap the back side of your phone to hide all emails that are not from actual humans. 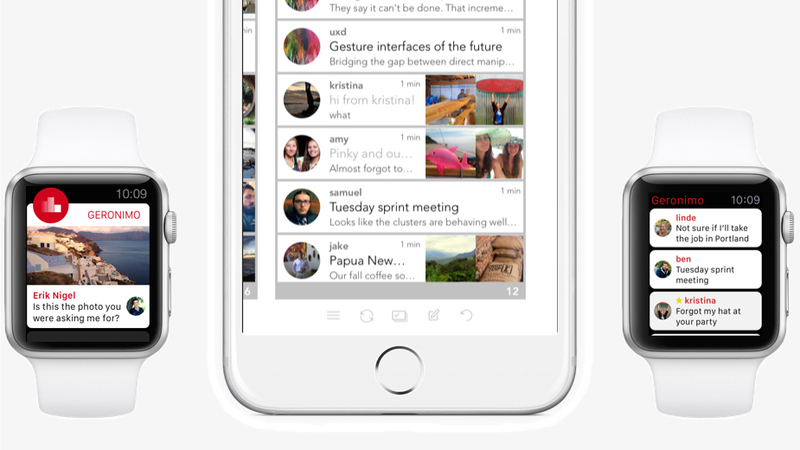 The iOS version will also let users annotate images, rearrange emails in any order they wish, and view messages on a horizontal timeline. Geronimo will be available to download for free from 27 August. You can sign up for a text reminder at the company's website.